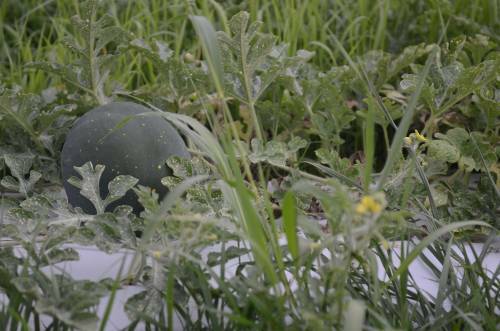 Steven Kirk has grown watermelons, in combination with cover crops, for several years – more so as a cultural practice than a research study. That all changed three years ago, when Deborah Finke, an associate professor in the Division of Plant Sciences, was able to secure a grant from Ceres Trust to study how cover crops can be integrated into an organic watermelon production system to reduce weed pressure, attract beneficial insects and build soil health. Growing watermelons is nothing new for Steven Kirk. 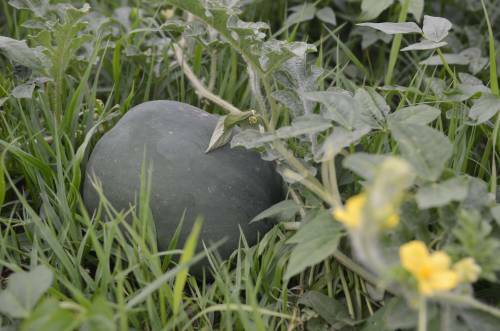 Kirk has grown watermelons, in combination with cover crops, for several years – more so as a cultural practice than a research study. That all changed three years ago, when Deborah Finke, an associate professor in the Division of Plant Sciences, was able to secure a grant from Ceres Trust to study how cover crops can be integrated into an organic watermelon production system to reduce weed pressure, attract beneficial insects and build soil health. Kirk, a research specialist in the Division of Plant Sciences, serves as the technician on the project, which takes place at the Bradford Research Center, in Columbia. Kirk planted around an acre of watermelons as part of the project. The project is broken up into … Expand ▸Kirk planted around an acre of watermelons as part of the project. The project is broken up into smaller plots to feature different cover crops and different planting intervals. Kirk is using three cover crops in the study – buckwheat, cowpea and yellow sweet clover. The cover crops were planted at four different intervals: one week before the planting of the watermelons, the same time as watermelons, one week after the planting of watermelons, and two weeks after the planting of watermelons. The grant from Ceres Trust was part of its Organic Research Initiative, which began in 2009 with a focus on providing research results for organic farmers. Kirk planted around an acre of watermelons as part of the project. The project is broken up into smaller plots to feature different cover crops and different planting intervals. Kirk is using three cover crops in the study – buckwheat, cowpea and yellow sweet clover. The cover crops were planted at four different intervals: one week before the planting of the watermelons, the same time as watermelons, one week after the planting of watermelons, and two weeks after the planting of watermelons. “While the project has several foci, my primary objective is looking at the weed control and soil health in this cover crop and watermelon system,” Kirk said. “It’s an organic project, so we don’t have the same tools in our toolbox as conventional farmers. We’re really just planting everything and letting it go to see how well, and if, the cover crops suppress weeds. All of the plots are tilled just prior to each cover crop planting to get a jump start with weed suppression. “We’ve tilled everything right before we plant,” Kirk said. “If it’s dry on Thursday we’ll till the land to plant on Friday. This is the final year of the project, so Kirk is still waiting to complete his data collection. He has noticed a few trends during the first two years of the study. So far, both buckwheat and cowpeas have done a nice job of suppressing weeds. The cover crops planted after the watermelons have also seen better success. This is the final year of the project, so Kirk is still waiting to complete his data collection. He … Expand ▸This is the final year of the project, so Kirk is still waiting to complete his data collection. He has noticed a few trends during the first two years of the study. So far, both buckwheat and cowpeas have done a nice job of suppressing weeds. The cover crops planted after the watermelons have also seen better success. The clover has been a little bit tougher to judge. The clover Kirk used during the first year of the project never took hold. Kirk switched to a different variety and saw better results last year. However, the clover has struggled again in 2018. Kirk is actually doing a separate clover study to nail down what varieties do well in central Missouri. The Missouri weather will definitely play a role in the study. Rainfall amounts were strong in 2017. This year hasn’t been as helpful in terms of rainfall, and Kirk has spent much more time watering the watermelons this year, while the cover crops have to rely only on the rain. The watermelons were planted toward the end of May and the beginning of June during each year of the project. Harvest takes place during the first part of September. Watermelons don’t need a ton of water to be successful. Watermelons are a unique vegetable, as it vines out instead of staying in place.